Recently I took the chance to try out a new MMORPG that’s been taking over the site skins of just about every anime site for the past month, Onigiri. This game with a double meaning for a name takes you into a world distinctly set in the realm of Japanese fantasy and folklore. The seal has broken that initially brought peace and safety to ancient Japan, and it is up to you and a ragtag group of anime tropes you meet on your way to rid the land of evil monsters and spirits, and ultimately force out Kamigui to restore peace once again. The game went into full launch just after I tested it out, and now has an ever growing population in its public launch state. Considering how long Onigiri was in beta, the fact that some key features were still missing at the time of launch was a bit concerning. And no I’m not talking about content but rather the ability to change the graphical settings. The only options you can adjust at all are the resolution and sound. On the plus side, controller support is offered in the options. Though it doesn’t take much game time to understand why the controller support is needed. Onigiri immediately reminded me of another major hit from Japan. It’s resemblance to Dynasty Warrior in both setting and style are unmistakable. Following in its footsteps, Onigiri even has found its way into the console market in Japan (Playstation 4), and hopefully the English version will make it stateside soon as well. I must admit that the last time I played Dynasty Warriors it must’ve been on the Playstation 2 and there have been plenty of new releases since, but as a result it took no less than 10 minutes to get a solid feel for the controls of Onigiri. The movement, fighting pace, and especially the graphics remind me a lot of this successful fighting game. But Onigiri is a little different, wearing its hat backwards so to speak. In Onigiri you will face monsters and other evil spirits instead of hordes of men. The challenge is more about dodging attacks of enemies that can stand and take a beating rather than wiping out dozens of opponents with a single sweep of your sword. And another key difference is that you won’t be fighting alone, but rather with companions at your back! Onigiri tries to be a MMORPG that heavily focuses itself on its story; straight away you will meet a companion that you befriend. She helps you out with finding your way around, and teaching you what to do with the weapons and pieces of weapons you find. You see, when you make a character you aren’t necessarily bound to one weapon. Throughout your journey you will find weapons and fragments that can be identified to become a useable weapon. When making your character however you do choose a defining fighting style to use. And seeing as there are plenty of weapons for dealing damage up close or at range, there’s some serious fun to be had with experimenting on how each weapon type best utilizes your skills and style. Moving your character around is done fairly easily. You run around with WASD and aim your attacks via a mouse controlled crosshair. Left click is for basic attacks, and right click is for the currently selected skill. The way skills are set up is quite nice. Each weapon features a different set of skills, as well as varying reaches even amongst the melee weapons. Choosing a weapon doesn’t bind you to one style for the duration of a mission either, as you can equip four weapons total at a time. With the F key you can easily rotate between your weapons on the fly to adjust to ever changing challenges. Just visualize a girl’s handbag with bottomless storage space hanging on your belt, and you’ve got the jist of the situation. Despite the seemingly casual friendly art style and outward appearance of Onigiri, the learning curve is brutal. The first few monsters you face will either teach you the importance of utilizing all of your skills through the school of hard knocks, or outright kill you before you can figure it out. 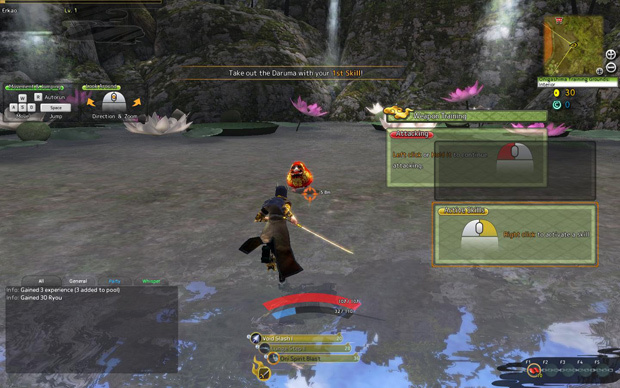 Rather than just dealing damage, they offer the utility needed to dodge power attacks in this action oriented MMO. Most of the time I played I spent glaring at my energy bar hoping I could hold out long enough for one more strike. When using basic attacks, you will regain the energy required to cast these skills and spells, but remember to aim your skills well because if you miss, you might just cost you the fight, and send you back to one of the many respawning options. Most places you will visit are instanced gauntlet zones. The further you progress, the more challenging enemies become, culminating in an inevitable and predictable boss battle like an old school arcade fighter. As I said, the learning curve is intense in this game, so expect to lose a few times to even the earliest of bosses. Onigiri is not a game for those looking to play something with an easy win button. Onigiri is a challenging and refreshing action MMO set in a style that will bring a hefty dose of nostalgia to any Dynasty Warriors fans. 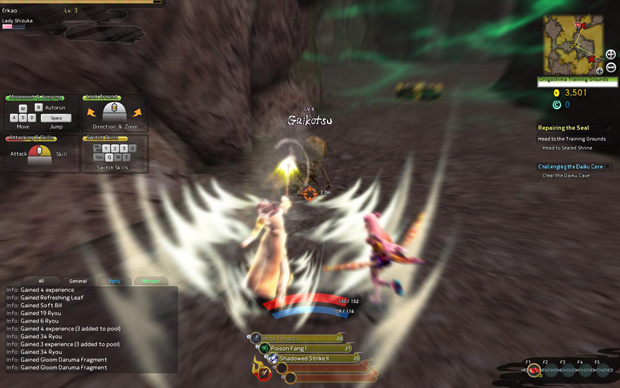 While many of its features are borrowed from console titles, experiencing them in a free to play MMORPG experience that you can share with players from other regions makes for an enjoyable romp. That said, the gameplay visuals are quite lacking, almost being comparable to a high end Playstation 1 title. Still if graphics aren’t a key part of your game valuation, the remainder of the package is solid enough to keep you entranced. The arcade feeling fighting style and brutal difficulty will keep you hooked for quite some time.